Recently labeled bottles of Rokuchoshi await packaging. The beautifully fragrant Kuma Shochu that we now know, with all of its botanical aromas and soft sweetness, is actually a relatively recent advancement in the tradition’s long history. 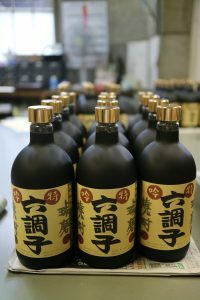 Much of this can be attributed to refinements in the ingredients and techniques used to make rice shochu over the past few decades. However, one of the most important changes came in the form of the equipment being used. Rokuchoshi Distillery near the Kuma River has long been at the forefront of such improvements. Say hello to the genatsu (reduced pressure or vacuum) pot still. The vacuum created inside the main chamber during distillation allows the fermented rice mash to boil at far lower temperatures than older pot stills, and the result is often a more delicate shochu. The earthier and bolder aromas are generally muted while fruit and floral notes are brought forward. 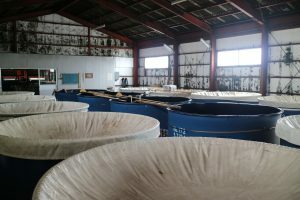 Rokuchoshi Distillery was the first Kuma Shochu manufacturer to install a genatsu pot still, and many other distilleries in the region soon followed suit. Mr. Ikebe wanders among barrels holding sleeping rice shochu. anyway, a risky decision given how popular low pressure distilled rice shochu soon became. Mr. Ikebe, the man who oversees the distillery’s 90,000 liter annual output, remarked that the decision to stick to the company’s roots was not all that difficult. They were confident in their ability to make delicately-balanced yet character-driven rice shochu, and they were equally determined not to let the category’s routes be totally forgotten. The gamble paid off. Rokuchoshi’s various brands have won multiple awards while giving fans subtle reminders of Kuma Shochu’s roots. The various iterations of the Rokuchoshi shochu lineup exhibit a wide variety of flavor components such as steamed rice, soft maltiness, sweet dairy, and tropical fruit. Among many other dishes, the drinks pair extremely well with sushi. The mid-level alcohol content, typically 25%, is a better palate cleanser than sake without being strong enough to overpower the fish. The morning sun illuminates covered vats inside the distillery. More recently, Mr. Ikebe has found new ways to innovate. He brought a thermometer and hygrometer with him on a trip to Scotland and figured out that the area surrounding Rokuchoshi Distillery has a very similar climate. His tours of various Scotch Whisky distilleries helped him decide that he could barrel age shochu in nearly identical conditions as long as he was extra careful during the Hitoyoshi Basin’s steamy summer months. He built a special temperaturecontrolled room on the top floor of his Taisho Era distillery and installed powerful air conditioners that run all summer long to control the humidity and protect the valuable barrels from mold and an otherwise early demise. Rokuchoshi only uses new casks, another departure from the industry norm. He said that it’s more labor intensive to rinse the charred barrel interiors, and spend extra time actually “breaking the casks in.” However, Mr. Ikebe, who doubles as the top representative of the Kuma Shochu Distillers Association, is convinced that there’s no better way to maintain control of the process. This is something that Rokuchoshi has always made certain to do, and the distillery looks set to continue leading Kuma Shochu’s global spread, ushering both the old and new out to new markets overseas. Christopher Pellegrini, author of The Shochu Handbook, happened upon shochu more than a decade ago, and his curiosity was piqued by the dearth of published information about it. 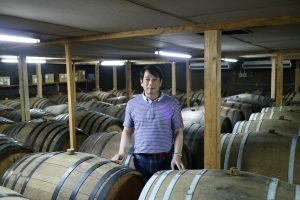 Many years of distillery visits, palate refining, and test taking later, he became one of the few Certified Shochu Sommelier (SSI) to be born outside of Japan. He now spends his time conducting shochu and awamori tastings, writing for various food and drink publications, and consulting restaurants, bars, and distributors on how to bring these drinks into the fold. A native of Vermont, Christopher was an accomplished pole vaulter and spent several years working for Otter Creek Brewing where he eventually inhabited the night brewing shift. Little did he know that his experience making good beer would lead him to a career in another high quality drink thousands of miles away. After a year in Spain and two in South Korea, Christopher moved to Tokyo, Japan in 2002, where a distinct lack of craft beer sent him straight into shochu's open arms. He has since found a home talking about Japanese food and drinks for an international audience. He is the host of Japan Booze Blind and Ishokudogen, two web series that cater to Japan's culinary fans around the world. Christopher holds an MA in language education from University College London's Institute of Education, and is the English translator of the survival Japanese textbook Konnichiwa, Nihongo! He has also been published in print and online outlets such as Koe and Global Insider.